My husband finally broke down and got a new car. Well, it’s a lightly used car…and I insisted. The thing is, his lovely 1995 Toyota Corolla was so rusted that when he went to get a shock replaced (he couldn’t budge it himself… and we found out why), our friend said that he was not going to touch it because it was so rusted together that all kinds of things would break off if he tried to. PLUS, it had a crack in the manifold – which means that during the winter when he has the windows up he would be sucking down exhaust fumes. He told me he would crack the window. Oh my. Anyway, he feels like he’s riding in the lap of luxury now. He won’t let the kids eat in his new car, vacuums it out often, and now he’s asking me for some natural, healthy air freshener to put in it. I was actually super happy that he didn’t just go out and buy some toxic filled, fake fragrance car air freshener. Reality is, if you can smell something, it means that you are breathing in tiny particles of whatever is making that smell (brings a whole new level of disgust into gross bathrooms). So if you are smelling an air freshener that was made with man made chemicals, you are breathing those chemicals into your lungs and your body has to deal with it. Now, as I’ve noted a zillion times, if it were that one thing, I’m sure these wonderful bodies of ours could deal with it. No problem. But the fact is that the list for what we put ourselves through daily is 20 feet long and counting. So, if we can choose a better way (a more frugal, healthy way), then it is totally worth it! This would be a fun gift for the kids to make for Grandparents, Mom, or Dad. One method that is circling the internet is using felt. We tried this and really liked it. Most people will tell you to use wool felt because of its absorbancy. The regular cheap kind absorbs just as well in my opinion, so that’s up to you. Cut the felt into the size and shape that you want. Punch a hole toward the top of it for the yarn. Place 10 drops or so of essential oils of your choice onto the felt. It will absorb them after a few seconds. Put the yarn through the hole and hang in your vehicle. **A Variation on this is to cut out two identical pieces of felt and sew them together, leaving a small hole to squeeze a cotton ball into. Then drip a few drops of essential oils onto the cotton ball and close. To reload, sprinkle on the felt and it will soak through into the cotton ball. Herbs are so wonderful and fresh. They make great air fresheners. To refresh, just crumple the air freshener a few times to crush the leaves slightly and release the scent again. Cut out two identical pieces of felt in the size and shape you desire. Sew the two pieces together, leaving a hole to insert herbs. Insert herbs and sew hole together. Use a hole punch to make a hole toward the top for the yarn. Thread the yarn through the hole and hang in your vehicle. Another idea that I love is using a tiny clothes pin. This is super easy and works whether you have the air on, off, hot or cold. I actually found a bag of little ones with cork on them at a craft store on clearance for a dollar. Score! Place 5-10 drops of essential oils on the clothes pin. Clip onto the air vent in your vehicle. This idea is simple and great for those who want to put something under a seat and not see it. Remove the lid from the jar. Trace the metal lid on the cardboard and cut out the circle. Set aside the metal lid for another use, but keep the ring. Fill the jar half full with baking soda. Close lid with cardboard and metal ring and place in your vehicle, either in a cup holder or under a seat (though if it tips over it a little baking soda may come out). A lot of times at craft or kitchen specialty store you can find some small clay discs. I have one like THIS. This method is so easy and actually lasts a long time. It’s probably my favorite. Drop 10-15 drops onto clay disc. Allow the oils to absorb and then place in your vehicle. Don’t forget to Follow on Facebook and Pinterest! 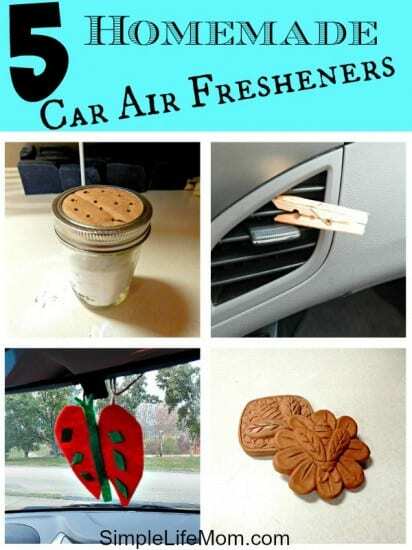 I’ve used the cloth pin air freshener for years and love how easy and well it works. I’ll have to give the other ones you’ve shared a try. Hah! I love that your hubby said he would just crack the window in the winter time! So glad you made him get a new car and I can’t wait to try out these great ideas! Followed you over from the Homestead Blog Hop and am happily pinning! Thank you Meaghan. Yes, I’m happy he got a new car too! I used the baking soda and essential oils in a mason jar in a closet cupboard that had a slightly musty smell to it. Worked great. I put the other ones in the vehicles and put the jar in a cupboard too. It really does work, and it’s a stress reliever too. I love great scents. I’ve tried the Mason jar and EO and it doesn’t work for me. Do you put multiple Mason Jars out or just one? I only use one with great results. Try using more essential oil. How bad is the problem? If it’s super stinky, then you may need to sprinkle some baking soda on the area and vacuum first. My car isn’t stinky…it just doesn’t smell enough. I was expecting to have a good scent in my car for hours/days but smell almost nothing. The only thing that has worked so far is a commercial scent from Bath and Body works…but I wanted to use a home made one. I unserstand. The baking soda method is usually used to absorb odors. 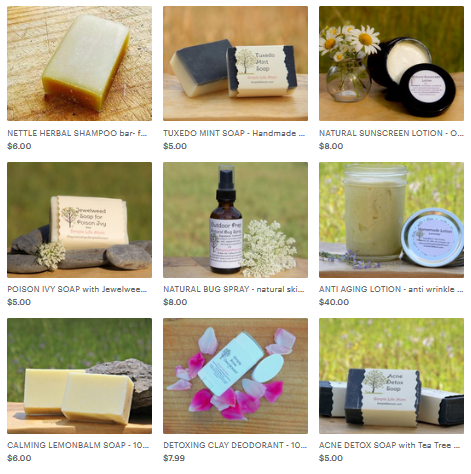 My husband’s favorite is the felt with essential oils. He puts it in a pocket in the door so you don’t see it, but he loves the effect. My husband is still buying the nasty chemically air fresheners. I love this idea! I’m going to suggest it to my daughter as a gift to make Dad for Christmas. He’ll use it AND get the chemicals out of his car! Great ideas! Maybe I can finally convince my husband to get rid of the nasty febreze clip in his car. I think I’m going to have my preschooler make the clay disc kind to give as gifts this year. These are great! I’m gonna do the air freshener in a jar! Thank you for sharing with us at Hump Day Happenings! Thank you so much for sharing this on Homestead Blog Hop. I am making my husband these for his car this weekend! Mountain Man does NOT have the cleanest car. I shared this on my Facebook page too! Wow! Great ideas. My husband recently got a new (to him) car as well. First “nice” car he’s had since I’ve known him! Very exciting. Essential oils seem to be all the rage these days. I’m going to have to cave and check them out soon. 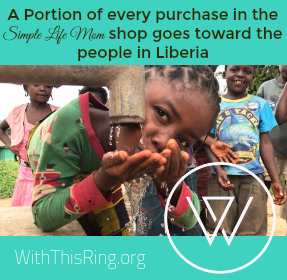 Thanks for sharing on the Happy Holidays Link Party! These are great ideas! I especially love the clothespin idea. And I completely understand the 1995 Toyota. Those cars run forever it seems…hard to let them go! I miss my Toyota! Thanks for sharing these great ideas and linking up at From the Farm Blog Hop…I chose this as my favorite from last week’s linkup! Have a wonderful weekend! Thank you Dawn. We really like the clothes pin too. The felt seems to hold the scent the longest though. Awesome ideas,should really try all. Cloth pin technique will be better i guess it saves time and smells nice. Will shortly pin. I am going right now to get some clothespins. 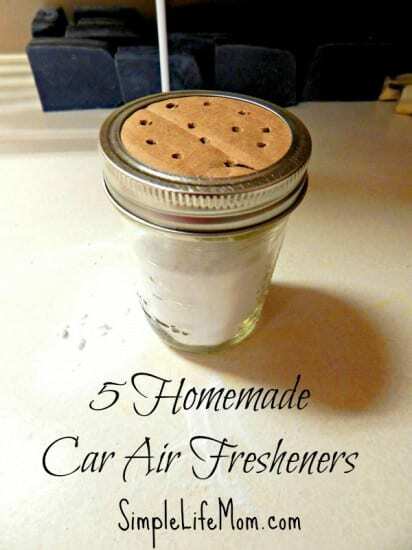 Making car deodorizers for both cars. I love the tried and tested models ….so I will try and test and get back. Great. Please do. I love the clothes pin one. My husband thought the felt kept its scent the longest. I have never used a herbs in air freshener. I am going to try it next time. it sounds really easy and fast to be prepared. Thank you so much for sharing this useful article. I am so happy that I have learnt something new today! Greetings! You’re welcome. It is super fast and easy and so versatile! How often do you have to keep adding essential oil to all of these? Every other day, week, month? You’re welcome Nicole. I think it’s important to always have natural alternatives…and it’s fun! I have looked for the clay disk and can’t find them. Joannes Hobby lobby and dollar store. Looking in wrong place? You have to look in cooking utinsels for brown sugar savers. Oh wow! These r awesome ideals n r simple to do n dnt cost much at all. I’m glad u come up with these ideals. I wish I could have come up with these. Would love to know what u come up with New next. Where can I buy felt at? Can I buy it at dollar General? You can find felt at fabric and craft stores for only a few dollars. Wonderful Tania! I’m so glad you’ve been able to use the ideas. 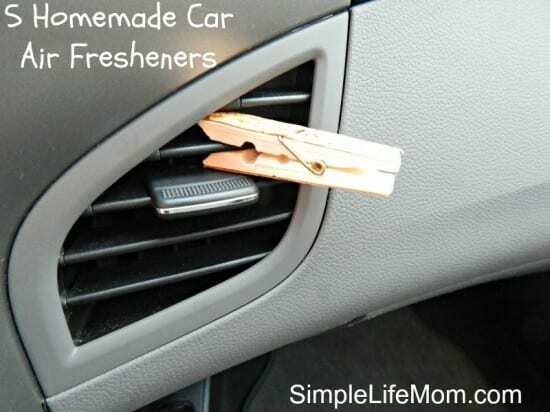 Homemade air fresheners is a great idea. Thanks for the tips. I love these ideas and I am going to try definitely try the little Mason jar with the essential oils. Tweeting and pinning!